The Tarney-Spencer Band was an Australian rock band composed of Trevor Spencer and Alan Tarney in the late Seventies. The band recorded three albums: 'Tarney and Spencer' (1976), 'Three's a crowd' (1978) and 'Run for your life' (1979). 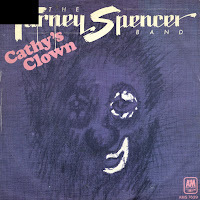 In 1979, the band was released from their contract with A&M Records after the release of the non-album single 'Cathy's clown' . It peaked at number 31 in the Netherlands in early 1980. Trevor Spencer left the UK and returned to Perth to help start Sh-Boom studios with Gary Taylor. Alan Tarney began working as a producer in 1979 and was largely responsible for masterminding Cliff Richard's resurgent chart career in the late 1970s and mid-1980s with world-wide-hit 'We don't talk anymore'. He also produced A-ha's first three albums.